FAN GoH: Robert Sacks [deceased, August 2000] we celebrated his life! Robert passed away after accepting the role of Fan Guest of Honor. 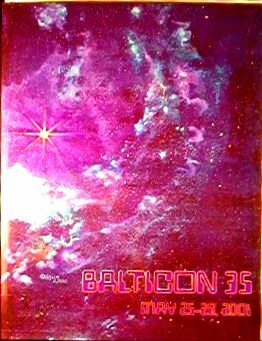 With the full support of the Sacks family, Balticon is continuing to designate Robert as Fan GoH---the same way as someone who has passed away may still be awarded the Medal of Honor. Balticon 35 Ancecdotes and stuff: If you have any information concerning this convention that you would like to see included here, please send it to "webmeister at bsfs dot org" and look for it to be published here! !